We undertake the damp course injection, removal of radiators, skirtings, removal of old plaster and reinstatement of all to make a fully waterproof job. We usually recommend replastering due to salts in the plaster destroying the new decorations and also in this case you can redecorate after around 3-6 weeks with our specialist waterproofers. 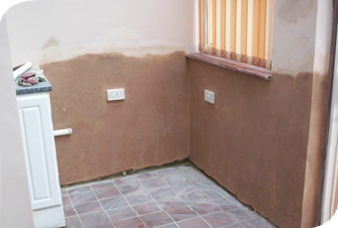 If the replastering wasn't undertaken the walls will still be wet for up to 10 months on a 9 inch wall with internal render. Some clients think they have damp on their walls, this is in the form of black mould, this is not always damp but usualy condensation. Sometimes this can be brought on by a very small leak causing cold spots on walls and lack of ventilation. We specialize in Mould control. We only use injection fluids of the highest quality and for Professional use only, high strength waterproofers for above and below ground, with a professional finish.